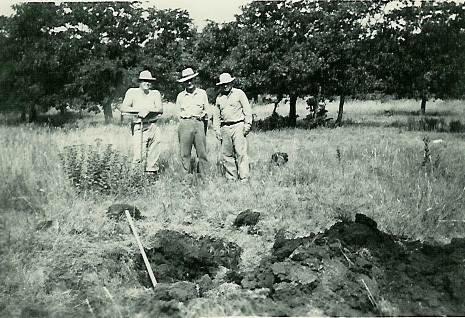 In March of 1934, Joe Hunter, an avid treasure hunter, was combing through the rugged granite boulders near Bear Springs in the Wichita Mountains of southwest Oklahoma. On that day, he discovered a brass bucket. The find would make history, due to its unique inscription. On the bottom of the bucket was a patent date of Dec. 16th, 1851, extended in 1873, and manufactured by E. Miller and Company. The bucket was a treasure in itself. Chiseled deep into its sides fifty-eight years prior to Joe’s discovery was an outlaw contract which formed a bounty bank for all who would sign below. These outlaws had made their mark on a contract which stated, “This the V March 1876 in the year of our Lord one thousand eight hundred and seventy six. We the undersigned do this day organize a banty bank. We will go to the west side of the Keechi Hills which is about fifty yards from a crossed set of rifles. Follow the trail line coming through the mountains just east of lone hill where we buried Jack, his grave is east of a rock. This contract made and entered into this V day of March 1876. This gold shall belong to who signs below.” Carved into the bucket were the names: Jesse James, Frank Miller, George Overton, Rub Busse, Charlie Jones, Cole Younger, Will Overton, Uncle George Payne, Frank James, Roy Baxter, Bud Dalton, and Zack Smith. Though many clues had been found, Hunter and his partners searched for more than a decade for the elusive treasure without success. The Lawton Constitution dated Sunday, February 29th, 1948, featured the story of Hunter and his long quest for hidden treasure. The story spread like wildfire across the nation. It was Hunters’ hope that, by coming forward with news of his discoveries, he might be given the final clues to unearth the long-sought treasure. What Joe Hunter failed to realize was that the bucket contract itself was the map needed to find the gold. The bounty bank was hidden in an area some thirty miles to the northeast of where the James Gang had camped and hidden the bucket. Just a mile east of Cement, Oklahoma, stands a lone hill that has made a unique landmark for travelers throughout the ages. Known locally as Buzzard Roost, this hill is where Hunter unearthed a cast-iron tea kettle containing gold, coins, a pocket watch, and a copper treasure map, but that is another story altogether. Buzzard Roost happens to lie in a set of limestone hills known as the Keechi Hills. This same lone hill happens to be the one mentioned in the brass bucket contract. On the north side of the Roost was carved a set of crossed rifles. Time and the elements have long since erased this important clue, but an aged photo taken in the late 1940’s shows a clue never reported by Joe Hunter. I discovered this clue while looking through some old photos that had belonged to Hunter. 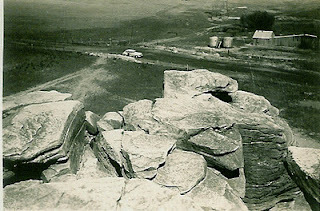 The picture taken from the top of Buzzard Roost and looking toward the northeast clearly shows the name JACK spelled out using rocks. A rock with a carving of a pistol had been found by Joe just to the west of where JACK lay and due north of the Roost. This rock was another clue that had been mentioned in the contract code. Having gone public with his story of the James gang brass bucket contract, Joe hoped to profit from his sudden celebrity status. He soon sold the brass bucket to a group of Texans, but upon their departure with the bucket they cancelled the check used as payment. Joe was forced to travel to Texas to recover his beloved bucket. After Hunter’s death, the brass bucket disappeared into history. It wasn’t until I was given a lead informing me that it was in the collection of Craig Fouts, a noted western memorabilia collector, that the bucket’s location was revealed. It is still unknown how much of the bounty bank remains to be found. What is known is that part of the loot was uncovered in the early 1900’s by workers digging a pipeline northeast of the Roost. The value of the fortune they discovered in the ditch they were digging is anyone’s guess, but it was reportedly enough that they walked off the job never to return. This is but one of many treasure stories associated with Buzzard Roost and the Keechi Hills. Time will tell what remains to be discovered. The number one question I'm asked is have I found anything, but the second most asked question is how do I find so many treasure stories. I often ignore the first question but a simple answer to the second is research. My research methods vary but searching newspapers is always a good start. The older the story the better. I have a number of keywords I use to hit on articles that may lead to hidden loot. Remember that you're not just looking for the words buried treasure. I look for stories about old hermits, bank robberies, money being found, etc. These simple stories may yield clues to hidden wealth. I have found dozens of stories about old hermits passing away and money being found hidden in various places around the home. Many of these newspaper articles were written before the time of metal detectors, so a search of the property these days could put a little jingle in someones pockets. Old treasure magazines are good sources as well. While there are many bogus stories that have been written over the years you, can on occasion, find a kernel of truth. I also talk with other treasure hunters and old timers that may remember a story they heard from days gone by. One treasure cache I'm working on now came from a ghost story I heard. Without giving too many details away, the part I was interested in was the ghostly glow coming from the orchard. If you've read anything about Louis Matacia and his theories on finding treasure you'll understand why I was interested in this story. In a never ending effort to keep the blog interesting I'll be making some changes soon. I hope to start adding videos that we will shoot, edit, and produce ourselves that will show actual treasure sites and the signs and symbols we find on the them. Of course these won't be active sites that we are currently working on but they will be interesting all the same. I've already installed the video editing program on my computer and I'll have the professional video equipment soon. As I gain experience I hope to shoot a few documentaries that will include finding a lost city here in Oklahoma, Frank James, J. Frank Dalton, artifact hunting, and whatever ideas our readers may come up with. If any of our readers have experience with this sort of thing I'll gladly accept any helpful hints you may have. This just might get me to switch from searching on land to researching sunken ships. I love hunting for treasure of any kind and hunting for stone artifacts is just as much fun as hunting for gold and silver. The thrill of knowing that you are the first person to hold a point since it was lost hundreds or thousands of years ago. Stone artifacts add such a personal element to the search. These were tools necessary for survival. They give a look into the past and are works of art at the same time. I have logged many hours walking river beds and plowed fields and I've enjoyed every minute of it. Just as with treasure hunting research plays a key role in artifact hunting. You can save yourself a lot of time and empty pockets by learning where and what to look for. Searching a river bed is fairly straight forward. I have found points in the gravel bars, sides of the river bank, and deep in the channel. Along with stone artifacts many other items can be found as well. Bottles, buttons, fossils, bison teeth and skulls, have been recovered. I have a friend who found an old silver Morgan dollar in a river bed. Youtube has numerous riverbed hunting videos and I encourage you to check them out for little tips and hints for a more successful hunt. Campsites can be a challenge to find, but with a basic idea of what you would need to survive you can locate a few likely areas. I hunt the hilltops near spings, above the flood line near natural river crossings, horseshoe bends in rivers, etc. I've even found points in urban areas as well. Many of our early cities were established on former native campsites. Kill sites are another good area to search. 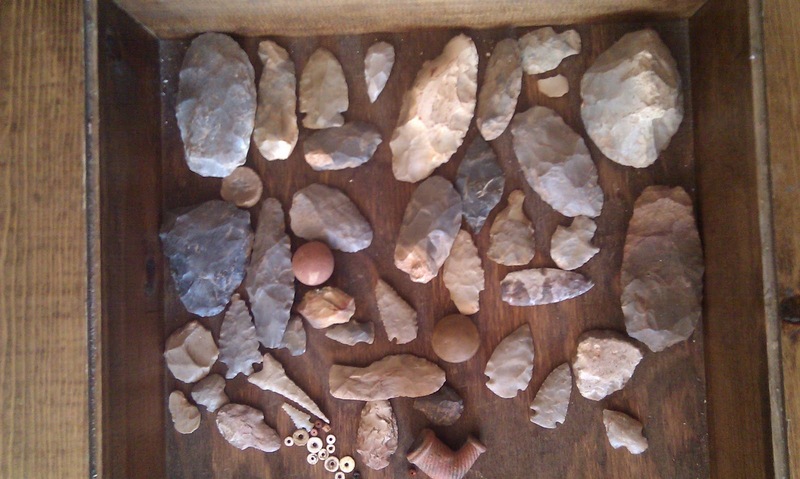 The base of a high bluff, box canyons, or the narrow portion of a canyon have proven to produce points or tools. Once again Youtube will give you videos to watch and pick up a few more ideas of how and where to hunt. With A.R.P.A. looming over your shoulder make sure you are searching in a legal manner. This means you need to check local, state, and federal regulations before beginning your search. To play it safe I only surface hunt on private land. Joe Hunter finds 13 old silver dollars and a silver pitcher. In July of 1949 Joe Hunter, Herb Penick, Lester Paden, and Richard Brock climbed to the summit Mount Sheridan and repelled down the steep slope using a 300 foot rope. Searching the numerous small caves they found the object of their desire. A silver pitcher with coded carvings upon it, blackened by time and the elements, that held 13 silver dollars dating from 1879 to 1881. The silver pitcher with it's mysterious carvings has long since faded into history. Perhaps it now adorns someones mantle or is tucked away in an attic or basement. No matter the final resting place of the silver pitcher it holds clues to the location of $23,000 Joe Hunter thought was hidden nearby. 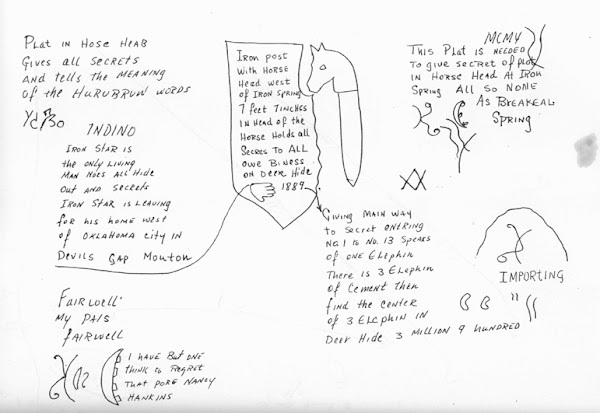 The life and adventures of Joe Hunter have long held my interest and I am slowly putting the puzzle pieces together. 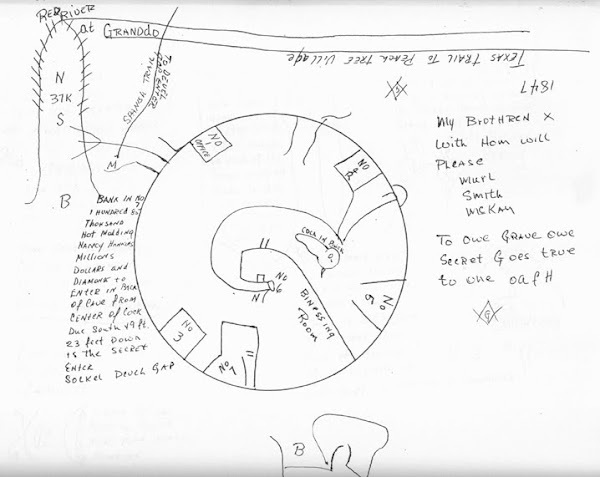 I have been blessed to find many of Joe's person papers, pictures, and maps, but the hunt continues for what still remains to be found. I'm always interested in buying any items or information related to Joe or other treasure hunters, so feel free to contact me.